Call: 1.877.786.6299 or Contact Us Today! 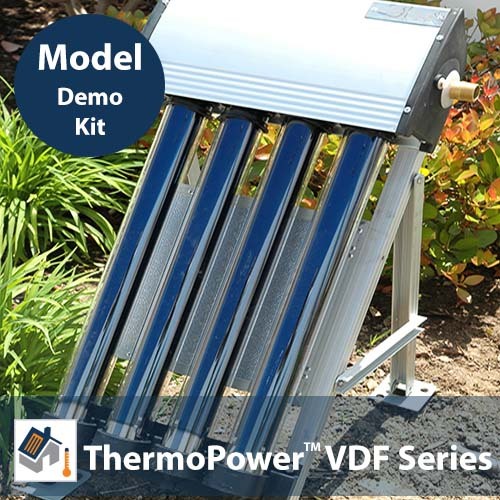 SKU: ThermoPower-DEMO-VDF. Category: Demo Solar Hot Water Collectors. No documents available for this product. ThermoPower: These sample versions of our SunMaxx Vacuum Direct Flow Collectors are fully functional models our full sized collectors. Perfect for distributors and installers to use to pitch projects to customers. The best way to demonstrate SunMaxx Vacuum Direct Flow collectors for customers is to use a hands on, easily portable model which you can use to help answer their questions. The collector comes with four shorter, but fully functional tubes, complete with heat pipes and mounting hardware. Great for solar education or science projects. We also have other fun Solar Educational Kits. If you have questions, need help, or simply feel uncomfortable placing your order online, feel free to contact the product representative at 1-800-786-0329.